Call me a dungu but I only just found out from my sifu that there is now Whatsapp on Web. Yup, Whatsapp Chat can be downloaded onto your desktop computer and laptop. Have you been Whatsapping from your desktop computer too? No wonder la, she can always reply me at lighting speed with really long messages! She’s been typing from her desktop keyboard while chatting on Whatsapp. And I was wondering how she can type so fast. I have never liked to use Whatsapp coz of the tiny keyboard on my phone. And darn the annoying auto-correct spelling which makes typing such a nuisance. Now I can Whatsapp friends and customers from my computer at lightning speed! Just go to Whatsapp.com and download the app onto your computer. Then there will be a code for you to scan using your android phone from the Whatsapp Chat menu of your android phone. I was stuck with scanning the code and I went to You Tube for visual help. Within seconds of bringing my phone to my desktop screen, TING and the Whatsapp chat appeared on my computer… like a magic wand doing its magic work! Amazing!! On Sunday, the hubs brought us to Low Yat Plaza to shop for a handful of computer accessories for our 2 desktop computers at home. 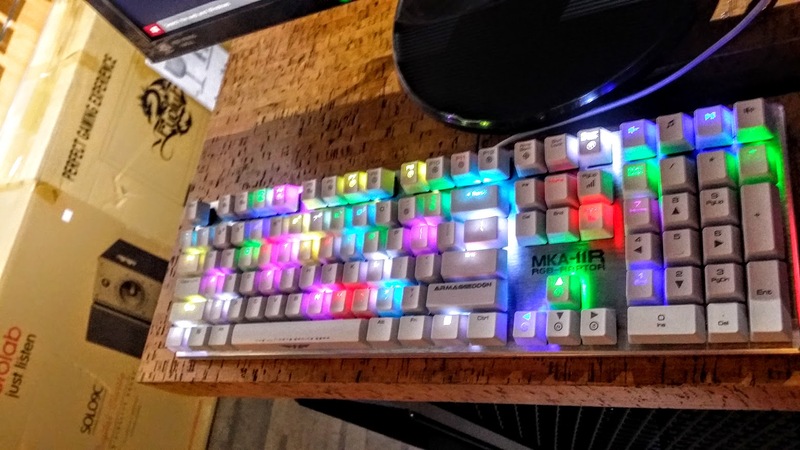 While looking around the computer accessories, this keyboard with dancing fluorescent lights on the keyboard caught my eyes. The lights would blink randomly on the keys, like disco lights. Awwww, I wanted it! The girls were besotted with it too. 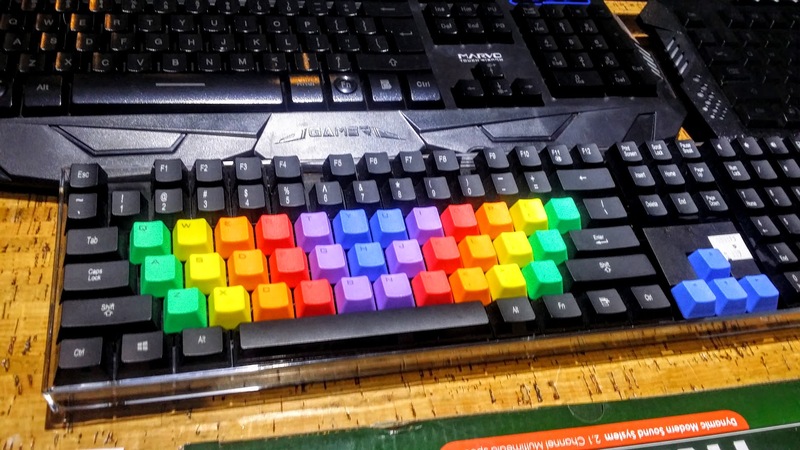 Next to the dancing lights keyboard, we saw a keyboard with bright neon colored keys on it. Awww, I wanted this too!! But no, the hubs said NO as the wireless keyboard that he had bought for me isn’t even a year old. Fine, I rest my case. Plus he’s about to spend a few hundred bucks on a new speaker for Alycia’s computer, a new web cam for my desktop computer so that I can Skype from my computer, a super cute Hello Kitty handphone cover for me and a few other stuff for our electrical gadgets at home. The hubby surprised me with a set of new cordless keyboard and cordless mouse yesterday. 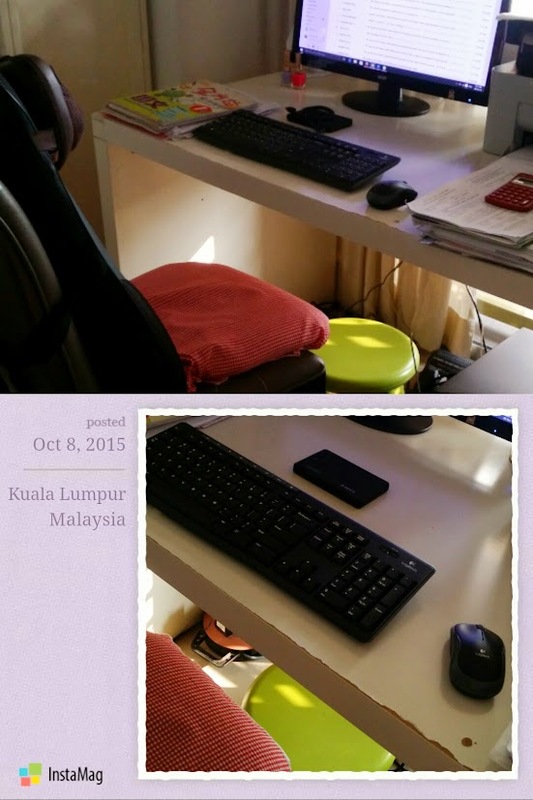 When I got up in the morning, I saw a shiny keyboard and mouse without the usual messy entangled wires on my work table! I suspect that my occasional stiff shoulders are caused by lunging forward to use the keyboard and mouse whenever I am seated on the massage chair in front of the computer. My shoulders will turn stiff and achy if I work continuously on the computer for hours on end. Our body should be upright and not lunged forward in a 45- degree pose. Now I can work comfortably on my computer while I get my shoulders, arms and back massaged by my portable OTO massage chair and have the keyboard and mouse placed right in front of me comfortably without having to stretch out my arms and neck! Bliss! Now I Can Download Movies And Huge Files At Lightning Speed! One of the things that give me the peeve is when my hubs downloads movies on my PC. I don’t mind sharing my PC with him but each time he downloads movies, my PC begins to act up. First, it slows down and eventually ‘hangs’ up on me. Another thing that irks me is when my PC gets a warning that it has encountered a problem and it then gets ‘hang’ again when I enter certain websites or blogs. I related this problem to my hubs’ friend recently and he suggested that we install a VPN (virtual private network) into our computers. We later found out from this friend why all these slowing down and ‘hanging’ on our computer are happening each time we download movies and big files. You see, the ISP (Streamyx or your internet provider) has this automatic control system that is able to detect whenever you download something that they do not allow, for example movie torrent. When this happens, your speed will be reduced significantly. Why are they doing this? That’s because they do not want to invest their money to expand their infrastructure. So obviously the best way is to control your speed so that you will not use up their resources. Unfair right? Well, you can scream at them or write endless complaint letters but all these will get you no where. This is when the VPN thingy comes in handy. With this VPN, it acts as a guardian or middle-man between your computer and the internet. You don’t connect directly to the internet – you connect to the internet through the VPN’s anonymous servers, thus your privacy is protected. When your identity is hidden by the VPN, all your activities on the internet will not be known by ISP (Streamyx or your internet provider), thus ISP has no means to control your speed. This service would certainly bring good news to those living in certain countries that ban or censor their citizen’s internet activity. My hubs had just subscribed to the VPN service for his computer and it only costs him RM10 per month for 15-20GB. I have asked him to subscribe to this service for my computer too. With VPN, I will be able to download my favorite TVB series, Korean drama, games for my 2 older monkeys, etc at lightning speed, YAY! BTW, this is NOT a sponsored post. Since we moved into our new condo a year ago, my internet has been connected using a wireless router. My hubs had to buy a wireless router because of the location of my desktop and the location of the wall socket, which is not side by side anymore like it used to be in our old house. Initially, I was really apprehensive on the stability of the internet connection using a wireless router. Now, I am glad to say that the internet connection using a wireless router is MUCH stable than using a non-wireless router. So far, I have not had any major problem with my internet connection, knock on wood! A wireless router is a combination of a router and a wireless access point, allowing devices to remotely connect to the internet and each other without the need for messy cables. A wireless router is NOT a wireless access point, which is a device that creates a wireless network (WiFi) and connects it to a wired network. For home use, most people will use a wireless router, unless you plan to have multiple access points. If you are looking to upgrade or buy a new wireless router, I would suggest you to do some reading first to gather some information before deciding on which one to buy. And oh yes, don’t forget to get a VPN firewall (virtual private network) in addition to the above mentioned products to protect your files. One of my money making plans that’s in the pipeline is to create several more niche blogs. This plan has to be put in the backburner now due to lack of time and Baby C’s health situation. Hopefully by next year, I can work on my plan and I would then need to look for a reliable web hosting provider. While poring the internet today, I found out that I can read independent review of the top 10 web hosting providers in 2008 at webhostinggeeks.com. I gathered from Web Hosting Geeks that I can even find a web hosting provider who can provide me with web hosting service from as low as $4.95 a month and free domain forever. If you are also looking for a web hosting provider to host your website or blog, quick check out webhostinggeeks.com. You may also want to read a good article on the Three Steps To Finding A New Web Host. Have you heard of ESET smart security from Software Security Solutions? It is a single resource for best-in-class computer security software. If you have not purchased a good security software for your computer yet, ESSET smart security is a good buy. The ESET Smart Security prevents, detects and removes malware such as adware, bots, rootkits, spyware, trojans, viruses, worms and other Internet threats from your computer, on the job, at home and everywhere that your computer goes. Best of all, the ESSET smart security is very affordable and costs only $59.99 for 1 computer for a 1-year license or $89.99 for 1 computer for a 2-year license. If you are not completely satisfied with the software, worry not as there is a 30-day money back guarantee. Ever since the network card in my PC was struck by lighting, I have a phobia whenever there is lightning. My computer technician advised me to get a surge protector which acts to protect my PC, the modem and our telephone line. The protector is affixed to the wall socket and all other plugs are affixed to the protector. It costs RM70 and he came to install it today. Hopefully this is really useful. Does anyone of you have a surge protector for your computer and modem too? The computer guy finally sent my computer back. I was told that my computer was badly invaded by virus!! No wonder it keeps hanging and acting so strangely lately. He had installed an AVG anti-virus software into my computer. He had also installed the new version of Internet Explorer, version 7 into my computer and consequently, my Blogspot blog went haywire. The header is still distorted now and I have to get if fixed soon. The computer guy also told me that the motherboard in my CPU is in a terrible state and it will conk out anytime. OMG, this means I have to buy a new CPU and that’s going to cost me RM1,500+. Well, I hope I get to earn more now that my ranking has gone up so that I can replace my CPU before it pulls the plug on me. I woke up at 6am today hoping to grab some offers and to complete my outstanding assignments. But my computer wouldn’t cooperate. It took me ages to download the advertisers’ websites. Some websites were fine but I had problems with most sites. I thought my computer was acting up again and restarted it but after it was rebooted, the situation was the same. I had already wasted an hour trying to refresh each screen and to reboot the computer. I then decided to call Streamyx and it was then that I found out that certain areas in the Klang Valley are experiencing Streamyx disruption. Oh what the fun, if only I had known earlier, I could have just continued with my beauty sleep instead of dragging myself up for nothing. So I didn’t manage to do anything this morning until around 10am. What a bummer! Is anyone facing problem uploading pictures into your blog (Blogspot) today? I’ve been trying to upload pix to my blog the whole afternoon but kept getting the “unable to display page” message. This is just so frustrating. I hope it’s not a virus attack on my computer or anything wrong with my blog or computer. Yay!! My blog problem is finally solved last night. I wish to thank everyone who had given me their advice, especially to Girlie as she told me that the problem could be due to some codes that I’d added to my blog. When she said codes, it didn’t strike me immediately that it could be some widget codes from advertisers. It was only 2 days later that it struck me. I also prayed hard to God to help me solve my problem as I was really desperate to get help and I think He heard my cries for his help. No one seemed to be able to help me with this problem and it was such a nagging problem coz I had wasted so much time whenever my blog ‘hang’ and I had to log out and log in countless times each day. So the solution was I removed the ad from The News Room. I have been adding ads from The News Room into my blog for months but never encountered any problems with my blog, except that when the video was being downloaded into my blog, my blog would slow down for a few seconds. I changed the ad and added a new one a week ago. When I finally had time to sit down and ‘study’ my blog last night, it finally dawned on me that it could be this ad that’s the culprit. When I had removed the codes for the ad from my blog, voila…. my blog was processing fast again and didn’t ‘hang’ anymore. I’m so glad that my ordeal is finally over after more than 1 week. So to bloggers who have ads (esp. videos) from The News Room, please be warned that it could slow down your blog and cause the memory to run out. Blogger Problem or My Computer Problem? Remember I wrote a post about me encountering some problems with my blog? I have deleted some files from my C drive, as advised by Cherry and also performed a disk defragmentation. However, the problem still persisted. Each time I clicked on my blog to perform a task, eg. clicked on a link to another website, clicked on the perma link, clicked to edit post, clicked to create new post, etc., it would take at least 3 minutes for my computer to process the task. In addition, a message which states “Stack overflow at line : 63” or “Out of memory in line : 56” would apprear. Most times, my blog will just ‘hang’ and I would have to close it a few times and log into Blogger again. However, if I perform a task or even a few tasks within half a minute of logging in to my blog, my computer will have no problems processing the tasks. Once the half minute is up, my blog will hang and the error message would appear. I have no problems logging in to other websites. This is really driving me nuts. So much time is wasted everyday. I’m not going to write to Blogger Help Desk for support coz it’s useless. I’d in the past written to them a couple of times but never got a reply. Can someone please help me solve my problem, pretty please? To all my blogging pals and fan-sees, sorry if I’ve not replied to the comments you had left in my posts yesterday and today. My blog is acting up big time and causing me headache since yesterday. I’ve lost count on the number of times I had to log out of Blogger and log in again for each task that I had to perform. I wasted many hours logging in and out of Blogger and shutting down my PC today. I just hope my PC is not infested by a serious bug or virus. My hub’s computer wiz friend will come over tonight to investigate the problem. I’m praying that my PC will be A-ok.
Cherry — thanks for advising me to delete some files from my C-drive. I did that but that does not seem to help. Is anyone experiencing problem with Blogger (Blogspot) for the last 2 days? I am experiencing extremely slow downloading time of my blog, editing and creating my posts and a host of other problems. Each time I attempted to edit my post, I get a message stating “Out of memory at line : 56”. That’s the reason why I hadn’t written many posts or visited many blogs for the last 2 days. I hope my computer is not infested with some bugs or virus. I think I’d better ask my hubby to get his computer buff friend to check out my computer before it conks out.